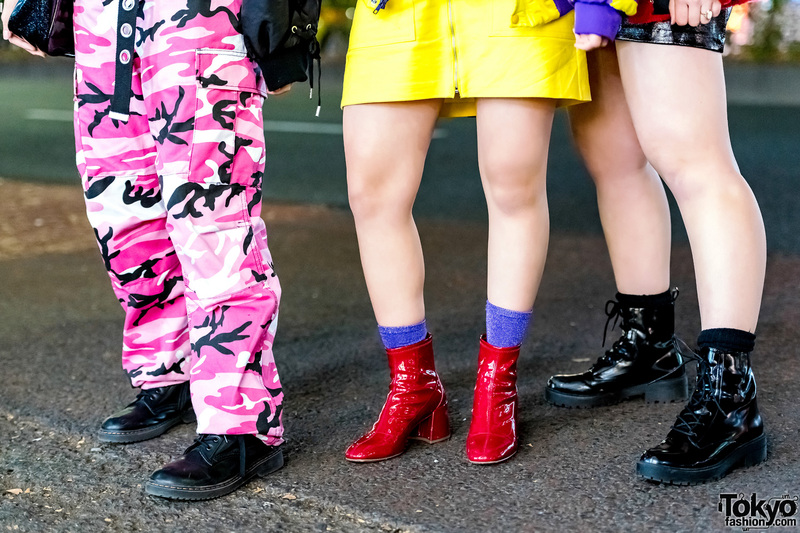 We spotted a trio of 17-year-old students clad in stylish outfits while wandering down the streets of Harajuku. 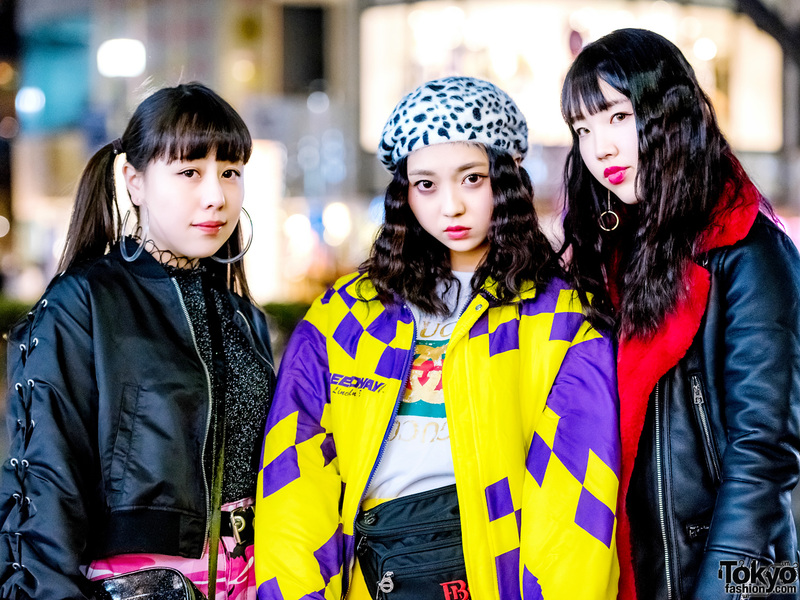 On the left is Aina, who donned a WEGO black bomber jacket over a WEGO top. She styled them with pants that featured a striking pink camouflage print. Aina completed her look with GU black lace-up shoes, a black Bubbles sling bag, twin tails with bangs, and Bershka accessories. Her fashion favorites include Faith Tokyo and Easy Baby, and she likes listening to Katy Perry and Justin Bieber. Follow Aina on Instagram. In the middle is Hina, who stood out in her Dalmatian hat and bright yellow outfit. She wore a Pinnap yellow-and-purple jacket, which featured fitted cuffs and a front zip closure. 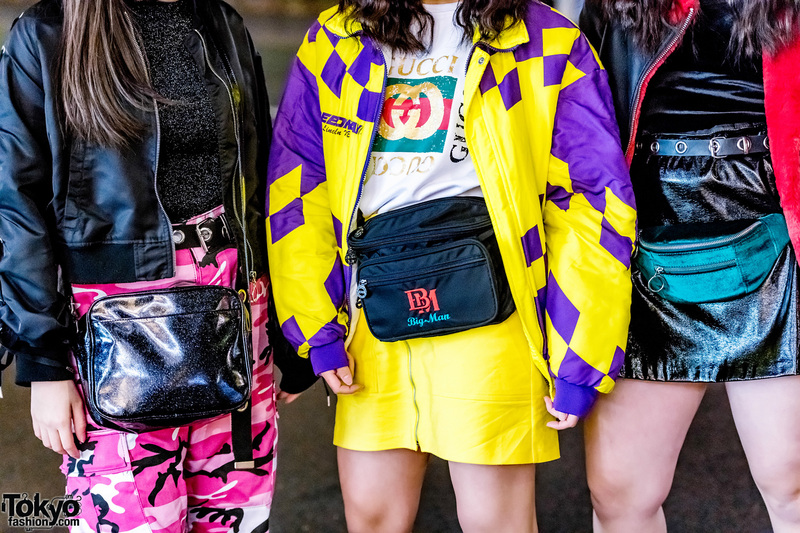 Hina wore it over a Gucci white graphic tee and a Gucci bright yellow zip-up skirt. She styled her look with red block-heeled boots from Bershka, purple socks, a black bag, and a WEGO belt. Hina names Pinnap as a fashion favorite, and she enjoys listening to music from Big Bang. For more on Hina, follow her on Instagram. Finally, Momoka donned an all-black ensemble from Bershka and Forever 21. She brought some edge to her look in a Bershka black leather jacket with contrasting red lining and zipper closures. 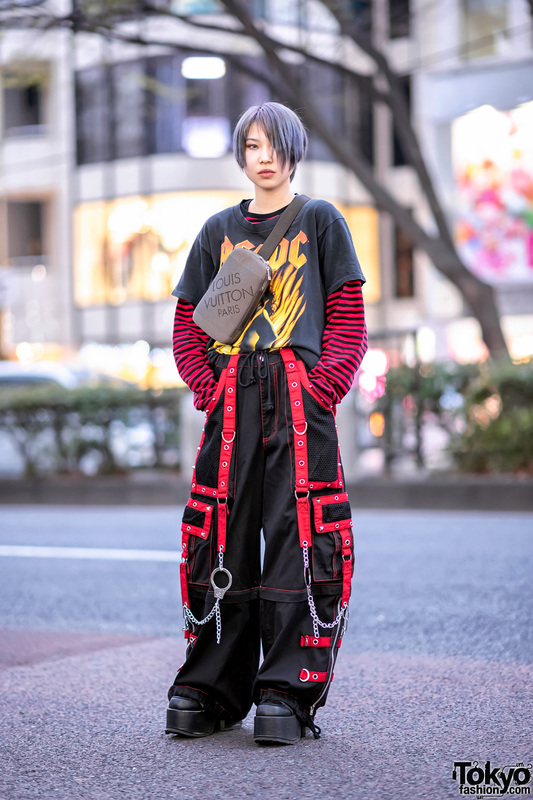 Momoka wore it over a Forever 21 black top, which she tucked into a Forever 21 black mini skirt cinched at the waist with a thin grommet belt. She finished off her look with a Bershka waist bag, black socks, Bershka black lace-up boots, and Forever 21 accessories. Momoka’s favorite fashion brands are Forever 21 and Bershka. She also enjoys listening to Generations from Exile Tribe. She is also on Instagram.